The Cayman Islands are three small islands in the northwestern Caribbean Sea, northwest of Jamaica and south of Cuba. British sovereignty over the islands was recognized in the 1670 Treaty of Madrid, and they have remained as British territory ever since. Long governed as a dependency of Jamaica, the Cayman Islands became a separate self-governing overseas territory of Britain when Jamaica gained its independence in 1962. 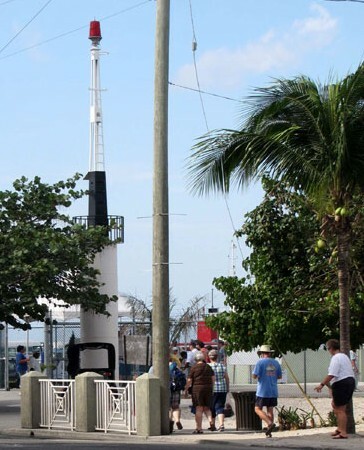 The Caymans do not have any traditional lighthouses. However, there are several historic beacons regarded locally as lighthouses. 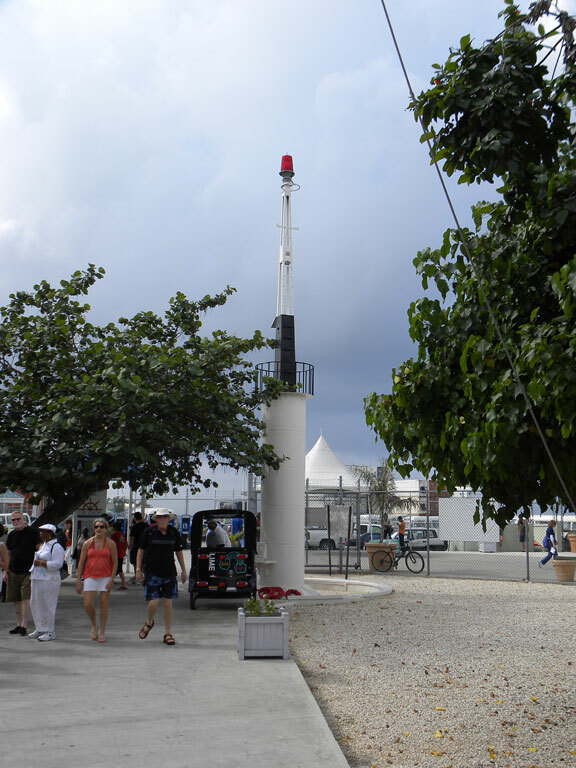 Aids to navigation in the islands are maintained and operated by the Port Authority of the Cayman Islands. ARLHS numbers are from the ARLHS World List of Lights. Admiralty numbers are from volume J of the Admiralty List of Lights & Fog Signals. U.S. NGA List numbers are from Publication 110. Photos by various photographers available from Wikimeida. Navigation chart information for the Cayman Islands. Date unknown (station established late 1930s). Active; focal plane 27 m (89 ft); one long (1.8 s) white flash every 15 s. 6 m (20 ft) square steel skeletal tower with gallery, painted white. Terry Fletcher has a photo but the small tower is not seen in Google's satellite view. Forand has a historic postcard photo of the roriginal light. Located at the northwestern point of Grand Cayman, at the end of a narrow peninsula about 16 km (10 mi) northwest of Georgetown. Site open, tower closed. ARLHS CAY-003; Admiralty J5222; NGA 13720. Date unknown (station established 1937). Destroyed 2004. Formerly a 30 ft steel tower. 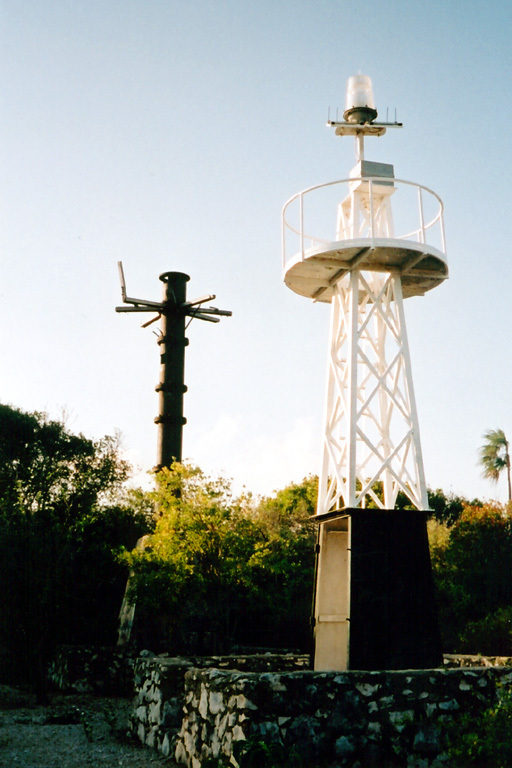 Originally built onshore near the southwestern point of Grand Cayman, the light was relocated around 1992 to Sand Key, a sandbar about 1 km (0.6 mi) offshore. Cayman Islands Port Director Paul Hurlston reports that the light was destroyed by Hurricane Ivan on 11 September 2004. No photo available. ARLHS CAY-004; ex-Admiralty J5230; ex-NGA 13732. 1980. Active; focal plane 13 m (43 ft); quick-flashing red light. 6 m (20 ft) round concrete tower topped by a skeletal mast. The tower is white with a black band on the mast. Douglas Cameron's photo is above, Trabas has Rainer Arndt's photo, Christopher Price has a street view, and Google has an indistinct satellite view. This light was built as a memorial to local sailors lost at sea. Located on Harbour Drive at Fort Street in Georgetown. Site open, tower closed. ARLHS CAY-002; Admiralty J5232; NGA 13716. 1937 (station established about 1907). Active; focal plane 22 m (72 ft); two 1.2 s white flashes every 20 s. 8 m (26 ft) square steel skeletal tower, painted white, on a small black base. Marc Barrison's photo is at right, Trabas has a photo, Cherine Usherwood has a 2018 closeup photo, Tisha Titus also has a closeup photo, and Google has a satellite view of the site. The original light was a kerosene lantern displayed from a 19 m (60 ft) ship's mast. 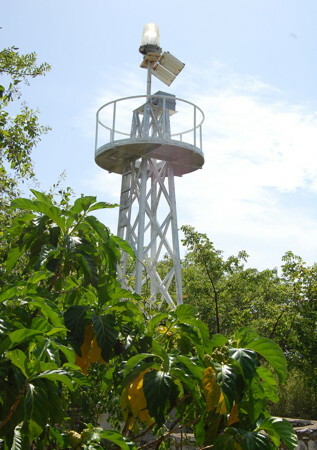 The second (1937) light was a steel mast with a lantern holding a kerosene lamp; remains of this light stand behind the current beacon. Located on a bluff in East End Lighthouse Park at the eastern end of Grand Cayman Island. Site open, tower closed. Site manager: National Trust for the Cayman Islands. ARLHS CAY-001; Admiralty J5226; NGA 13724. Date unknown. 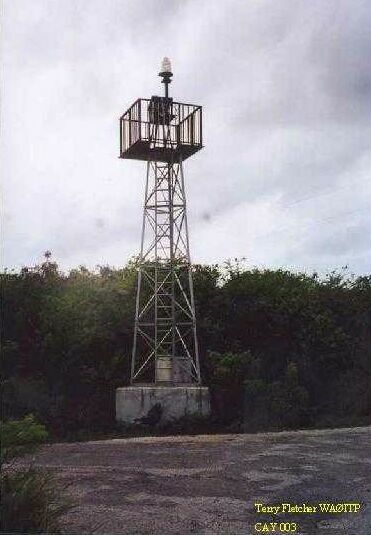 Active; focal plane 9 m (30 ft); white flash every 5 s. 6 m (20 ft) triangular steel skeletal tower. A TripAdvisor.com contributer has November 2015 photos but found the lighthouse "underwhelming." The small light is not seen in Google's satellite view. Located at the western tip of Little Cayman Island. Island accessible by air from Grand Cayman. Site open, tower closed. Admiralty J5236; NGA 13736. Date unknown. Active; focal plane 11 m (36 ft); two white flashes every 15 s. 6 m (20 ft) post painted white. T. Harrell has a 2017 photo, Phil Stahlfeld has a street view, and Google has a distant satellite view. Located at the eastern tip of Little Cayman Island. Site open, tower closed. Admiralty J5237; NGA 13740. Late 1930s. Inactive. 6 m (20 ft) square steel skeletal tower, lower portion enclosed. Lighthouse painted black. This light was replaced in the 1980s by a white triangular skeletal tower with a solar-powered lens (focal plane 46 m (151 ft); two white flashes every 15 s). Greg Paret has a good photo, Joseph Domingo has a 2008 photo, Forand has a postcard photo, and Google has a street view and a satellite view. Located atop a 43 m (140 ft) vertical cliff at the eastern end of Cayman Brac, an island about 130 km (80 mi) east northeast of Grand Cayman. The bluff is popular with rock climbers. Island accessible by air from Grand Cayman. Site open; nothing prevents visitors from climbing on the towers. Admiralty J5240; NGA 13748. Lighthouse Restaurant, Grand Cayman, has a 13 m (43 ft) dome-shaped stucco tower with a round lantern, rising from a 1-story restaurant building. This building is often listed as a lighthouse, but it has little or no navigational value. Joshua Ryan has an excellent closeup photo, and Google has a satellite view. The building was damaged by Hurricane Ivan in 2004, but it reopened in the spring of 2005. Located on Bodden Town Road on the south coast of Grand Cayman east of Georgetown. Posted September 19, 2005. Checked and revised December 2, 2018. Lighthouses: 0. Site copyright 2018 Russ Rowlett and the University of North Carolina at Chapel Hill.